With celebrations including costumes, skits and songs, noisemakers, and gifts of food, Purim is definitely full of fun! Purim is a joyous holiday that affirms and celebrates Jewish survival and continuity throughout history. The main communal celebration involves a public reading—usually in the synagogue—of the Book of Esther (M'gillat Esther), which tells the story of the holiday: Under the rule of King Ahashverosh, Haman, the king's adviser, plots to exterminate all of the Jews of Persia. His plan is foiled by Queen Esther and her cousin Mordechai, who ultimately save the Jews of Persia from destruction. The reading of the m'gillah typically is a rowdy affair, punctuated by booing and noise-making when Haman's name is read aloud. Purim is an unusual holiday in many respects. First, Esther is the only biblical book in which God is not mentioned. Second, Purim, like Hanukkah, is viewed as a minor festival according to Jewish custom, but has been elevated to a major holiday as a result of the Jewish historical experience. Over the centuries, Haman has come to symbolize every anti-Semite in every land where Jews were oppressed. The significance of Purim lies not so much in how it began, but in what it has become: a thankful and joyous affirmation of Jewish survival. 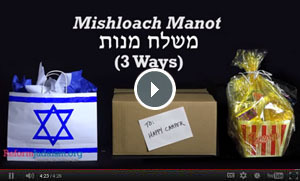 Here are three creative ideas for themed mishloach manot (Purim gift baskets). Purim has its own special cookie, called a hamantaschen, which has three corners just like Haman's hat. Together with your children, watch the Shalom Sesame videos to learn about Purim and the tradition of baking hamantaschen, then try some of the discussion ideas and activities recommended by Reform Jewish educators. Quiz: How Much Do You Know About Purim? In Mexico and parts of Central America you'll find a large Sephardic population from Syria and Lebanon, as well as a substantial Ashkenazi community. The Purim story presents us with a fascinating cast of characters. A misguided king, an evil adviser, a wise cousin behind the scenes, and the brave heroine who saves the day – there’s something for everyone. Send free e-cards and add a recipe, blessing, or video.